Wednesday, November 7th, 2012 . ÜberGiving Thanksgiving Giveaway! Win an Evernote notebook this week! We’re giving away 5 Evernote Moleskine notebooks + 3 months of Evernote premium with every notebook this week! Tell your friends about ÜberConference on Facebook and Twitter from now through November 23 to get a month of ÜberConference Pro plus enter for your chance to win some other über cool stuff! Automatically win a free month of ÜberConference Pro just for tweeting or sharing on Facebook. 2 Jawbone headsets – Rock your conference calling experience with this uber cool Bluetooth tool. iPad Mini – Want the hottest tech item of the moment? Of course you do. We are giving away one iPad Mini at the end of this giveaway. Now that is something to be thankful about. For Facebook – Go here for a chance to win. You get additional chances to win for each friend you get to sign up. Sign up here to get started. For Twitter – Make sure to follow @uberconference and tweet about us using the hashtag #ubergiving. You must be following us and tweet #ubergiving to get the month of Pro free. Follow @uberconference and RT this to automagically get a month of @uberconference Pro free! bit.ly/RBoZGD #ubergiving. Then, to enter to win one of the many great prizes, sign up here and then tweet about the prizes, your favorite ÜberConference feature, or whatever you want to share. Make sure to use the unique link you are given when signing up so you get credit for the followers you convert to sign up: Sign up here and then tweet to enter to win. You will automatically get a month of ÜberConference Pro free just for sharing on Facebook and Twitter. However, the more you share your unique link you get when you sign up and then get others to sign up, the more chances you have to win the Evernote notebook, Jawbone headset or iPad Mini. We will be giving out all the prizes over the three weeks of this giveaway. Wednesday, October 31st, 2012 . So we’ve gone and started an UberConference podcast. We call it the UberCast. Using the power of our technology, we’ll interview some of the best and brightest minds in business to help you go about yours. First up is a name widely known in any Silicon Valley startup circle, Cass Phillips. You wouldn’t know it if you saw her in action, but Cass Phillips, owner of the popular event blog Web Wallflower, is actually an introvert. This can be a crippling trait for any business owner who needs to reach the right people at networking conferences. Lucky for you, she shares all her insider secrets on how to talk to anyone, become an influencer and connect with the crowd at any event. People love to talk so really try to listen. Add to the conversation with insight. Challenge the person you are having a conversation with. Be authentic! Learn to be excited for others. Carry an empty glass with you in case you need to duck out of a stale or unproductive convo. Be honest, but only if you feel brave. If you are not truly interested in what the person has to say it’s okay to let them know you are not the right person to talk to. You can also politely offer to keep your eyes and ears open for someone they would want to connect to. Monday, October 29th, 2012 . New feature for UberConference Pro users! 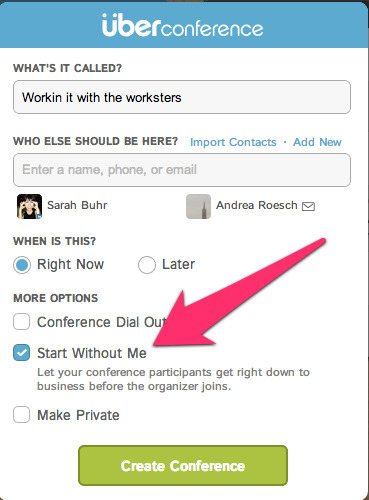 Now you can set up aconference call and not even be on the call. It’s great for times when the boss is running late or when the organizer may not be in the meeting. We call this new feature “Start Without Me”. 1. Click the “New Conference” button in the upper right corner of your “My Conferences” page. 2. You’ll see the new feature “Start Without Me” in the scheduling screen pop-up. Simply click the check-mark area next to the feature to ensure others can join the conference before you get there. 3. Click on the “Create Conference” button. Now others can join your conference with or without you. This feature is only available to Pro users. Sign up for your pro account and use this feature now. Sunday, October 28th, 2012 . Use Chrome? If not, you don’t know what you are missing. Chrome is a great browser for speed, security, ease of use and it offers the flexibility to integrate apps like ÜberConference right into Chrome. Installing theÜberConference Chrome app is simple, and lets you click to visit ÜberConference when you open a new tab in your browser. To get the app, just visit the Chrome Web Store and search for UberConference. After installing the app, you will see the ÜberConference logo appear in the Apps view of Chrome. Thursday, October 25th, 2012 . Google Apps user? UberConference now in the Google Apps Marketplace. Great news for Google Apps users! Now you can get ÜberConferencein the Google Apps marketplace, and run it right from your business Gmail or other Google Apps. Once you add the ÜberConference App, everyone in your Google Apps domain will be able to see ÜberConference in the “More” drop down list of the menu bar. Just click to log into ÜberConference whenever you need it. For those that don’t already have an UberConference account, a new one will be created with the user’s Google Apps email. Gmail contacts will also be automatically synched, making it even easier to get started with UberConference. When you create conferences you can just type in a few letters to bring up matching names from your contacts and click to add them to the call. UberConference takes care of sending out all the conference info to the email addresses and phone numbers you have saved for your contacts, and authenticates them based on their phone numbers so they can join your conference without entering PINs. We have had a lot of interest around people wanting to use UberConference in more ways across their businesses and organizations, and think the new Google Apps feature is a first step in doing more in this area. More enterprise features are coming soon.